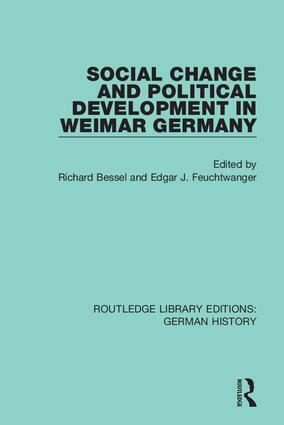 Originally published in 1981 and comprising research and interpretation from American, German and British scholars deals with many of the most salient facets of the Weimar period, including the revolutionary events following the First World War; the development of the Reichswehr; the role of heavy industry in shaping foreign policy, and the dissolution of the bourgeois party system during the last years before 1933. Each contribution examines the inter-relationships between social and economic change on the one hand, and political developments on the other. 1. Introduction: Themes in the History of Weimar Germany Richard Bessel 2. The German Revolution 1918-1920: Political Revolution and Social Protest Movement Wolfgang J. Mommsen 3. The Impact of the Inflation: Inflation, the Courts and Revaluation David B. Southern 4. Professionals and Junkers: German Rearmament and Politics in the Weimar Republic Michael Geyer 5. The Dilemma of German Agriculture during the Weimar Republic Dieter Gessner 6. Women in Weimar Germany: The ‘Frauenfrage’ and the Female Vote Helen L. Boak 7. The Politics of Corporatism: Hamburg Handicraft in the Late Weimar Republic, 1927-1933 Frank Dortmund 8. Working-class Life and Working-class Politics: Communists, Nazis and the State in the Battle for the Streets, Berlin 1928-1932 Eve Rosenhaft 9. Industrial Primacy in German Foreign Policy? Myths and Realities in German-Russian Relations at the End of the Weimar Republic Hartmut Pogge von Strandmann 10. The Dissolution of the Bourgeois Party System in the Weimar Republic Larry Eugene Jones.